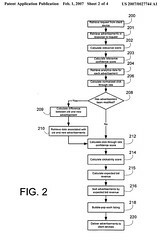 I posted last week about 13 New Yahoo Search Marketing Patent Applications. Add five more from Yahoo Search Marketing that I uncovered as I was combing through the rest of the week’s filings. The first thirteen mostly focused upon user interface and Application Program Interface (API) issues involving search marketing. These look a little closer at some of the algorithmic approaches, such as the calculation of a clickability score (click on the flowchart to the right to see a larger version – once there, click on “all sizes” and choose the largest for the most legible version). As I noted in last week’s post, what is described in these patent applications could possibly be different from what is actually implemented in a number of ways, but if you are interested in paid search you may want to take a look at them. Again, rather than analyze them in depth, I’m just going to link to them here, and post the abstracts from them. The present invention is directed towards systems and methods for ranking one or more advertisements. The method of the present invention comprises retrieving a result set comprising one or more advertisements responsive to a request. A clickability score is calculated for the one or more advertisements comprising the result set. An expected revenue value is calculated for the one or more advertisements using the clickability scores of the one or more advertisements as well as an indication of revenue associated with the one or more advertisements. The one or more advertisements are ordered according to the expected revenue of the one or more advertisements. Methods and systems for determining semantically related terms are disclosed. Generally, seed terms are received from a user. One or more potential terms semantically related to the seed terms are determined based on vectors comprising entries regarding a plurality of terms, a plurality of universal resource locators (“URLs”) associated with each term of the plurality of terms, and for each URL in a search log, a number of times that one or more users searched for each of the terms in the search log and clicked on the URL. At least a portion of the potential terms is then suggested to the user. The present disclosure is directed to systems and methods for determining semantically related terms. Generally, one or more seed terms are received from a user. A system searches a first index comprising a plurality of terms and one or more webpages associated with each term of the plurality of terms to determine a plurality of webpages associated with the seed terms. The system then searches a second index comprising a plurality of webpages and one or more terms associated with each webpage of the plurality of webpages to determine a plurality of potential terms associated with the plurality of webpages associated with the seed terms. At least one term of the plurality of potential terms is suggested to a user. The present invention relates to systems and methods for the optimized selection and delivery of one or more advertisements from among one or more advertising campaigns. The method of the present invention comprises generating one or more media plans identifying execution parameters for the optimized selection and delivery of one or more advertisements. One or more advertisements organized according to one or more advertisement campaigns are retrieved. Additionally, advertiser specified constraint and target values associated with the one or more advertisements are retrieved. A forecast for the performance of the one or more advertisements is generated. A media plan is generated for the one or more advertisements according to the constraint and target values, as well as the forecast data. The one or more advertisements are distributed according to the execution parameters identified by the media plan. It looks like they’re pointing to the first post – on the thirteen patent applications. Then I guess they should get up to date. This looks like a big deal to you guys in the SEO world, no? Has Forbes contacted you for comment? If Yahoo can make it easier for the marketer to use all those wonderful features you write about, it is all to the better. In all fairness, Alan, I posted about these additional patent applications after the author at Forbes wrote her article. The help sections at Yahoo look like they do cover a lot of what is described in the patent applications. OK, so I am a little unfair to the big media types. Have they been in touch with you about these patents? They haven’t and I don’t really expect them to. They’ve likely moved on to the next storyline or narrative that will help them sell magazines and gain page views.